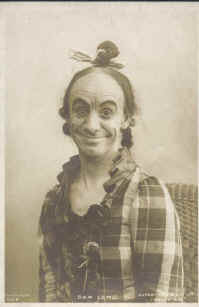 The legendary music hall artist Dan Leno was a major influence on all subsequent British comedians. Born George Galvin in 1860, he made his stage debut at age 4. 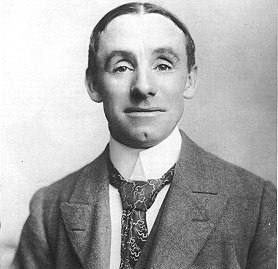 He became a star of the English panto in such productions as Jack and the Beanstalk (Surrey Theatre, 1886) and Babes in the Woods (1888, Drury Lane). In the 90s, he became a solo artist in music hall. His act would usually involve a little song followed by a character monologue. You know Mrs. Kelly?…You know Mrs. Kelly?…don’t you know Mrs. Kelly? Her husband’s that little stout man, always at the corner of the street in a greasy waistcoat…good life, don’t look so stupid, don’t – you must know Mrs. Kelly!…Don’t you know Mrs. Kelly? Well, of course, if you don’t, you don’t – but I thought you did, because I thought everyone knew Mrs. Kelly. Oh, and what a woman – perhaps it’s just as well you don’t know her…oh, she’s a mean woman. Greedy. I know for a fact – who’s got the sore eyes, he came over and told me – she had a half dozen oysters, and she ate them in front of the looking glass, to make them look a dozen. Now that’ll give you an idea what she is. In 1897, he played his only American vaudeville date, at the Olympia Music Hall, where he stayed for 4 weeks. In 1901, he appeared before King Edward, and thenceforth he billed himself as “The King’s Jester”. His brilliant career was cut short in 1903, when he was committed to a mental institution. He died the following year. While he died too young to have made any film appearances, he recorded several phonograph cylinders, allowing us to hear his vocal artistry a century later.